The Oklahoma Geological Service has posted some recent updates to fault lines and their relative stress levels. It's important to note that while the seismic activity has 'exploded' over the past 10 years, there seems to still be a lack of hard science to determine the cause. For the most part, petroleum fracking is ruled out as a cause. Wastewater injection is sill being suspected as a potential 'lubricant' of stressed fault lines. In the past year or so, the Oklahoma Corporation Commission has stepped up their oversight of the problem and seeks to relieve the public safety threats while retaining an important economic life blood' to Oklahoma. The biggest stresses to Oklahoma fault lines are illustrated above. Oklahoma historically has had a noticeable tremor once every few years, but in the past 10 years we have had a noticeable tremor about twice a day. the map below is edited to make it easier to view via your web browser. the original PDF file is available, here. Historically, Oklahoma has been a dormant state, seismically. The vast majority of fault lines remain so. Petroleum producers are continuing to put waste water back into the ground all over the state without any seismic incidents, in most cases. This work is an extension of Holland (2013) and is considered preliminary as our focal mechanism database and fault database (Holland, 2015) continue to be updated as more information becomes available. Six hundred and eighty-eight focal mechanisms were calculated between 2010 and 2015 and used to determine optimally oriented fault orientations within Oklahoma. Focal mechanisms characterize the direction of slip and the orientation of a fault and are calculated from seismic wave forms recorded on seismometers within and near Oklahoma. Identifying optimal fault orientations (those likely to have an earthquake within the contemporary stress field, N 85°E) is important for determining the potential earthquake hazard of both naturally occurring and triggered seismicity. 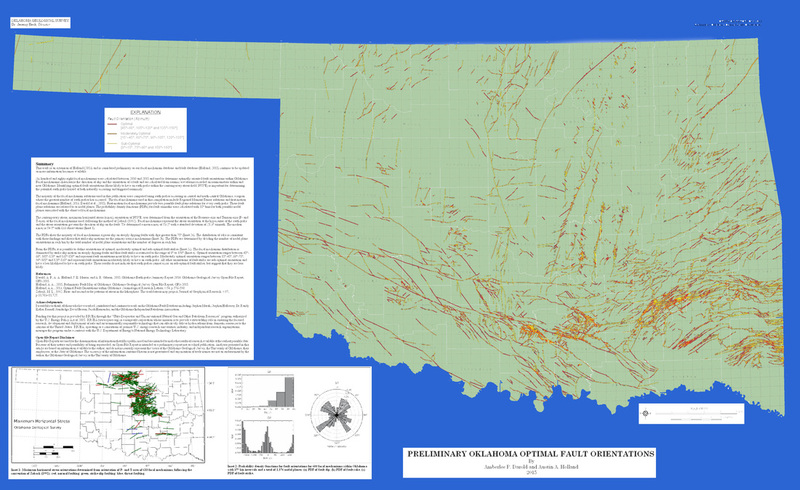 The majority of the focal mechanism solutions used in this publication were computed using earthquakes occurring in central and north-central Oklahoma, a region where the greatest number of earthquakes has occurred. The focal mechanisms used in this compilation include Regional Moment Tensor solutions and first-motion focal mechanisms (Holland, 2013; Darold et al., 2015). Those who have worked, contributed and continue to work on the Oklahoma Fault Database: Stephen Marsh, Stephen Holloway, Dr. Randy Keller, Russell Standridge, David Brown, Jacob Hernandez, and the Oklahoma Independent Petroleum Association. Funding for this project is provided by RPSEA through the “Ultra-Deepwater and Unconventional Natural Gas and Other Petroleum Resources” program authorized by the U.S. Energy Policy Act of 2005. RPSEA (www.rpse a.org) is a nonprofit corporation whose mission is to provide a stewardship role in ensuring the focused research, development and deployment of safe and environmentally responsible technology that can effectively deliver hydrocarbons from domestic resources to the citizens of the United States. Analyses presented in this article are based on information available to the author, and do not necessarily represent the views of the Oklahoma Geological Survey, the University of Oklahoma, their employees, or the State of Oklahoma. The accuracy of the information contained here in is not guaranteed and any mention of trade names are not an endorsement by the author, the Oklahoma Geological Survey, or the University of Oklahoma.